If you’re planning a trip to the Isle of Palms, South Carolina, chances are you’re looking for a relaxing vacation full of breezy, sunny weather and ocean views. Fortunately, the island offers just that! If sipping an ice cold beer or tropical cocktail while overlooking the ocean sounds appealing, you’ll enjoy an afternoon spent at one of the best Isle of Palms bars. Here are two of our favorites! As you begin planning your vacation, be sure to utilize our free Vacation Guide! This carefully curated guide features our top recommendations for Isle of Palms bars, restaurants, beaches, outdoor activities, shopping, and more. It’s the ultimate resource for the Isle of Palms and Charleston area. Get your copy today! The Windjammer is a lively oceanfront bar featuring fabulous drinks and a large deck overlooking the water. It’s best known for its live music, weekly events, and beach volleyball courts. Enjoy a refreshing beverage with ocean views or sit down and savor one of the many delicious menu offerings. Afterward, walk down to the beach and take a sunny stroll! From its annual bikini bashes to weekly karaoke nights, there’s always something going on at The Windjammer. The beach club maintains a few sand volleyball courts that are available to the public, so watch from the deck or join the fun and play a game yourself! Take a look at the calendar for a full list of upcoming events or simply show up and let the night’s activities be a surprise. The Dinghy is a longtime favorite bar of locals and IOP guests offering great food and unique beers on tap. Its maritime decor and laid back vibes provide the perfect backdrop to enjoy a cold one. Each month, the taproom’s calendar is full of live music which is performed on the spacious outdoor patio. One of our favorite things about The Dinghy is the weekly oyster roasts! During oyster season, the bar hosts an oyster roast every Thursday at 6:30 p.m. Enjoy fresh seafood, wonderful music, and great company. 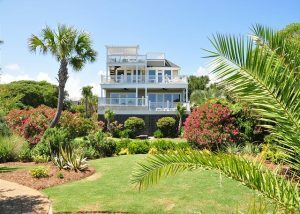 After experiencing the best Isle of Palms bars, restaurants, and activities, you’ll want to come back to the comfort and luxury of an East Islands Rentals vacation home. Our accommodations are conveniently located with easy access to the island’s best attractions. You’ll enjoy premium amenities and personalized touches including fully-equipped kitchens, exceptional views, the softest linens, and more. Many of our rentals are oceanfront and offer private pools. Our homes are the perfect place to spend a wonderful vacation with the people you love! Are you ready to experience all that the Isle of Palms has to offer? Book your perfect vacation home today and start looking forward to the ultimate trip. We look forward to hosting you soon!